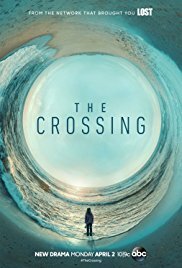 Way back in September, in my Fall TV Preview post, I mentioned that The Crossing was one of the new shows I was most excited to see. It was supposed to start in October, and I kept checking, but its start date kept getting pushed back. It finally started in March 2018, and my husband and I have been enjoying this intriguing sci fi thriller ever since! Steve Zahn (one of our favorites from Treme) stars as Jude Ellis, the sheriff of a small seaside Oregon town, who moved to the area to escape his past and live a quiet life. That life is shattered one night when dozens of people wash ashore in his town, many of them dead but some still alive. There was no record of a shipwreck, and these unusual refugees claim to have come from 180 years in the future, where the world is war-torn and violent. Jude is intrigued, especially by a little girl named Leah, played by Bailey Skodje, who washed ashore without her mother, who is not among the dead, either. The refugees are cared for, while the dead bodies are catalogued, until Homeland Security suddenly arrives on the scene and takes over, shrouded in secrecy, and ferries the refugees off to a hidden spot. But Jude can't forget them - especially Leah - and can't shake the feeling that something is off in Homeland's response. That's pretty much just a vague sketch of the plot of the first episode - to tell you any more would be giving away some of this show's many, layered secrets. It's a twisty, action-packed show with lots of suspense, but it has plenty of heart, too. Jude is estranged from his wife and eager to welcome his beloved son to his new home in Oregon, but it's a difficult time for some quiet father-son time with all that's going on. Jude is not the kind of guy to just forget about a group of people who seem to need his help. My husband and I are both loving this thriller with a time travel/sci fi twist and can't wait to see what happens next. The Crossing airs on Mondays on ABC. Eight episodes have aired so far in the 11-episode first season. You can catch up On Demand or on the ABC website (where episodes 4 through 8 are currently available for free and you can unlock the first 3 episodes by logging in with your cable password). It is also available on Amazon with the TV Season Pass or for $1.99 an episode (or $19.99 for the entire season). So, you could buy the first 3 episodes on Amazon and then watch the rest for free at the ABC website.